Quaid and Melina find that the creation of a breathable atmosphere on Mars was just the beginning. Without Kuato to keep them unified, many of the Mars resistance cells begin to turn on each other, and fight the Martian Army besides. Meanwhile, mutants continue to die from an unknown cause. Quaid meets a mutant named Q'd who claims he is preparing the way for the coming of the Martians. Quaid chases the mutant to the Pyramid Mines and discovers a second ancient machine. The mutant cryptically tells him that while the first machine brought air to Mars, the second machine will keep the air on Mars. And then he reveals the existence of a third machine that "completes the way." Then he activates the second machine with his hand-print. Amidst great rumbling and atmospherics, a trio of aliens walks through the Mars colony. from the dream/reality dichotomy of the Total Recall film. 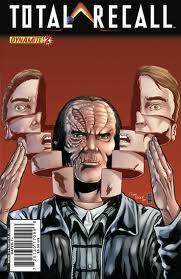 This issue's title, "Nightmare", is borrowed from a line of narration by Quaid in this issue. Cover B is a take-off on a scene in Total Recall, where Quaid reveals himself underneath the prosthetic face of a heavyset woman. Here, it is the mutant Q'd disguised as Quaid (though no similar scene ever occurs throughout the mini-series). Without Kuato to keep them unified, many of the Mars resistance cells begin to turn on each other. Notice that the names of the various cells all seem to be related to the planet Mars in some way, e.g. the Red Cell (the color of Mars) and Ares Cell (the Greek name of the God of War, for which the planet takes the Roman name Mars). On page 5, Tony comments, "all of our names will be mud." The idiom "my name is Mud" or "your name is Mud" is popularly believed to be a reference to Dr. Samuel Mudd, who treated the injured leg of John Wilkes Booth after Booth assassinated U.S. President Abraham Lincoln on April 14, 1865. Page 7 reveals that the name of the psychic woman is Cassiopeia. As the mutants begin dying, Quaid speculates that maybe there was a virus frozen in the ice that has been converted into the breathable atmosphere of Mars. This theory seems to be discounted later in "Dreams of Empire". On page 8, Tony states that he believes the unexplained deaths of mutants to be a "final solution" in use by the Mars Administration. This phrase is deliberately borrowed by the writer from Nazi Germany's Final Solution, which was its plan for the systematic extermination of Jews, what Hitler referred to as "the final solution to the Jewish question". On page 11, members of the Martian Army refer to the resistance members as "rebel scum". This may be a reference to the Star Wars franchise, in which Imperial military men often refer to the rebels of the Alliance as same. On page 13, Quaid has an encounter with a mutant stranger who says his name is Q'd. This is similar to the name stylings of the No'ui in Quaid's vision in the novelization of Total Recall. Does Q'd=Q'ad=Quaid? On page 15, Quaid's inner monologue even comments on the similarity of their names. This issue gives the impression that days have passed, yet everyone seems to be wearing the same clothes ever since the events at the end of Total Recall. On page 15, panel 1, notice that the Mars Burger restaurant from Total Recall appears (though the sign is shown as a digital one instead of standard plastic). Though some details are vaguely similar to the aliens mentioned in the novelization of Total Recall, the aliens depicted at the end of the issue are not ant-like as described in the novel.